Each year, more than 200 students, faculty and staff volunteer weekly in Carlisle, while many more engage in single-day service opportunities and hundreds participate in service trips. For Dickinsonians, preparing to become engaged citizens working toward the common good begins right here in Carlisle, where hundreds of students, faculty and staff volunteer each year. 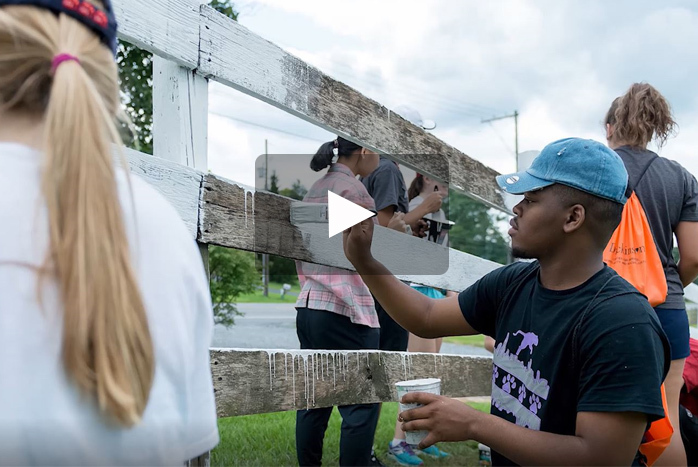 From the moment new students arrive on campus, the college introduces them to many options for service learning, community building and civic engagement. During Orientation, students participate in service projects with more than 40 agencies in the Carlisle and surrounding areas. The focus on service continues through all four years in programs like Montgomery Service Leaders, CommServ and Day of Service, and through civic engagement components in numerous courses across the curriculum. "Through my volunteer efforts and building relationships through all the work I do in town, I've learned so much about community building, organizing and just putting people together for the change that's needed," says Sofina Odero '18 (Africana studies), who volunteers at Hope Station, a local nonprofit designed to enhance the quality of life for local residents.